This page was added by Mick Smith on 20/11/2009. Brings back memories of the early 60's of walking out to the Lighthouse. You'd hear WUMP then quickly dash under the arches and watch the water come cascading down. We used to play chicken, see who would be the last to dash in and still be dry ! My sentiments exactly. I now live on the edge of another ocean and on foggy mornings when the strong smell of salt is in the air I always think of Newhaven. Used to cycle along under the Arches on a stormy day. Got a right soaking one time. I will always remember the Breakwater. Mick, was that taken from VTS station ? 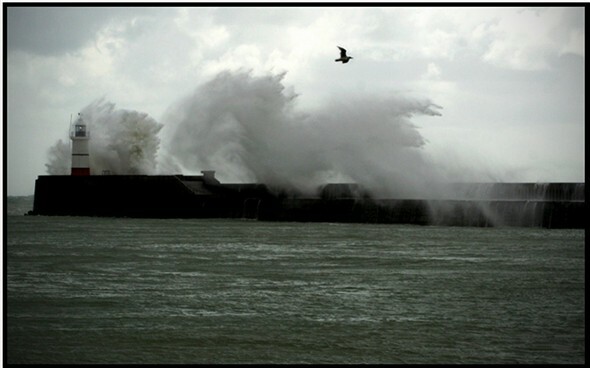 As per previous comments the breakwater always gives dramatic pictures when taken during south westerley gales etc . Glad they have now removed the recent scaffolding around the light house as it may not have been there after this autumnal battering we have all been witnessing during November. I watched the ferry Seven Sisters, leave the other day and can only complement the crew on the inner harbour manoeuvres, only to see it start a rather uncomfortable up and down roll as she cleared the breakwater! I hope they had plenty of sea sick bags on board for the 4 hour crossing . This really reminds me of the days spent under the arches sheltering whilst fishing.